Today, you can use tech for nearly everything – including taking out the trash. With smart waste management technology, businesses are able to track their trash more closely than ever before. Not only can smart waste collection systems help to cut costs, but they can help to reduce your business’s environmental impact. From trash can sensors to self-sorting trash cans, garbage collection has never been so high-tech. 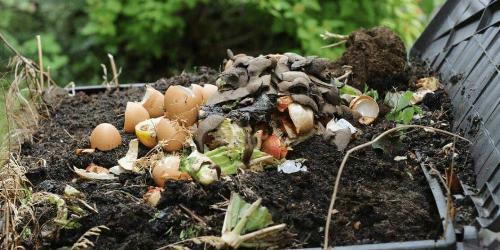 Here are six of the most groundbreaking waste management technologies in 2018. The OnePlus Metro from OnePlus Systems is an ultrasonic trash can sensor that lets you know how full your waste container is at all times. And the Wasteforce Platform allows you to easily monitor the capacity of your container from anywhere, providing detailed analytics to help your business or organization track your waste. Having complete visibility of your container can help to reduce the costs that come with overfilling a dumpster. This data can also help reduce fuel emissions by optimizing trash pickup schedules. “With hundreds of clients across the waste, recycling, waste oils and even charitable clothing sectors, OnePlus Systems has become the benchmark for container monitoring. We value our customer insights and continuously improve on our technology, with a particular focus on our software platform, WasteForce." Operating all over the world, including North and South America, Europe and the Middle East, Ecube Labs is an innovative company providing eco-friendly waste technology for various sectors. Their solar-powered trash compactor – CleanCUBE – can hold up to eight times more garbage compared to non-compacting bins, reducing collection frequency up to 80 percent. Their ultrasonic fill-level sensor – CleanFLEX – helps waste management companies increase collection efficiency by up to 50 percent. Other smart waste technologies from Ecube Labs include an integrated fleet management tracker and CleanCityNetworks, a cloud platform that combines waste container monitoring, route optimization, data analytics and fill-level forecasting. Based in San Francisco, CA, Compology provides image-based trash can sensors that automatically monitor fullness and contents. On top of that, the device features GPS tracking to help optimize driver routes and fuel efficiency along with tilt monitoring, which records when a container gets picked up and put down. This smart waste technology system allows roll-off haulers to manage container inventory, build better routes and even accept orders through automated text messages. And for front-load haulers, the software automatically determines which containers need service each day, then schedules routes and evenly distributes jobs to drivers. With over 2,800 kiosks in malls, large retailers and grocery stores across the U.S., ecoATM offers instant payment for old electronic devices. This smart waste collection system is a convenient option for managing e-waste, helping divert more than 14 million smartphones and tablets from landfills. Simply bring your old devices to the kiosk nearest you and your device will be properly recycled or refurbished for resale. Consumers looking to trade in devices can receive a quote based on the condition and type of gadget. And if you’re looking to purchase, Gazelle’s online marketplace offers great deals on gently used electronics. Next on the list of fancy garbage cans is the EvoBin from EvoEco. This smart waste bin tells you which items should be composted, trashed or recycled at your organization. As objects are tossed into the bin, a scale system detects the change in weight and triggers a customizable message that slides, scrolls or pops onto the screen. The content can be modified to show items that are typically tossed at your specific venue. This smart waste system offers a dynamic, educational experience designed to reward users for responsible waste disposal. 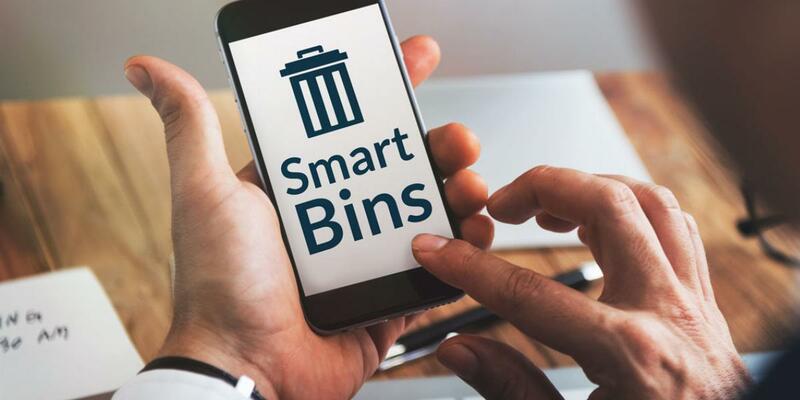 Bin-E is a smart waste container that automatically recognizes, sorts and compresses waste using a camera, sensors and artificial intelligence. Once the device identifies the material, shape and color of the waste, it is distributed into the appropriate bin within the container – plastics, paper or glass. After that, the waste is compressed so the total volume can be up to five times less. Once full, this self-sorting waste bin automatically notifies your trash collection company. This allows for collection routes to be optimized for improved fuel efficiency. Not only does Bin-E solve the problem of improper waste sorting, but it also tracks and sends data about the collected waste to an integrated cloud. Your business can then use this information to identify consumer consumption patterns and determine more eco-friendly product options. 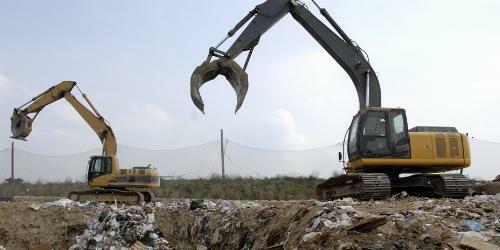 Excited About Smart Waste Management Technologies? We sure are. Implementing the systems listed above can benefit your organization in many ways, including assisting with waste diversion rates, reducing recycling contamination and helping achieve LEED certification. We love staying up-to-date with the latest advancements in smart waste management to better serve you. Do you use smart waste cans or other technologies at your home or business? Let us know how they’ve helped you in the comments below! To learn more about the latest in the waste trends and advancements in landfill technology, check out the Industry News section of our blog.